The same scientific quest for which Erika Edwards won recognition from President Obama on May 5 had two months earlier led her and 12 students up dusty mountainsides in the world’s driest desert. PROVIDENCE, R.I. [Brown University] — Here are two things that Erika Edwards picked up this spring: some dusty dead branches in Peru’s Atacama Desert, and in-person plaudits for her Presidential Early Career Award for Scientists and Engineers at a White House ceremony with President Barack Obama. And yes, they have everything to do with each other. Both the award and Edwards’s expedition, conducted with the 12 undergraduate students in her Biology of Desert Plants class, stemmed from research funded by the National Science Foundation since 2013. Edwards investigates how a lineage of plants called portulacineae have evolved special means of photosynthesis to cope in situations where regular photosynthesis isn’t feasible. This year the White House honored her work and her teaching with the nation’s highest award for young scientists. “We congratulate these accomplished individuals and encourage them to continue to serve as an example of the incredible promise and ingenuity of the American people,” Obama said in a statement in February when he announced all 105 PECASE award winners, including Edwards. The special photosynthetic means that Edwards studies are known as “C4” and “CAM.” She pursues them through deep time and around the globe to learn how, when and where they came to be. Everyone learns in school about the garden variety, or C3, brand of photosynthesis: Plants use chlorophyll as they take in carbon dioxide, light and water to make sugar. But when water is scarce, plants prevent it from escaping their leaves by closing up the little holes called stomata that they also use to take in carbon dioxide. C4 and CAM are ways of making the most of the carbon dioxide they can get when threatened by drought (or if carbon dioxide is scarce in the plant for some other reason). Some parts of the Atacama receive no rain. Plants subsist on seasonal fog. In CAM, the focus of the Peru expedition and PECASE award, the scheme evolved this way: Plants open their stomata at night when temperatures are cooler, rather than during the day, which means they lose less water. They then store the carbon dioxide in chambers in the leaf for photosynthetic use in the day when there’s light. That may sound simple, but it requires a logistical coordination of many different enzymes and structures within the leaf that must have required many distinct evolutionary changes. “We don’t really know anything about how this system evolves,” Edwards said. “The purpose of the grant is to start to suss that out, by focusing in on one group of plants that we think has evolved CAM many times over the last 40 or so million years. We have also identified many species that are neither C3 nor strictly CAM — rather, they have a photosynthetic system somewhere in the middle. The Atacama Desert was an irresistible place to look for CAM and C4 species — and patterns of where they grow and where they don’t — for a couple of reasons. The Atacama is the driest of the world’s deserts, with some areas receiving not even a millimeter of rain each year. In addition, Edwards’s former postdoc Monica Arakaki is now a professor at the National University of San Marcos in Peru’s capital, Lima, so she had a built-in collaborator there. 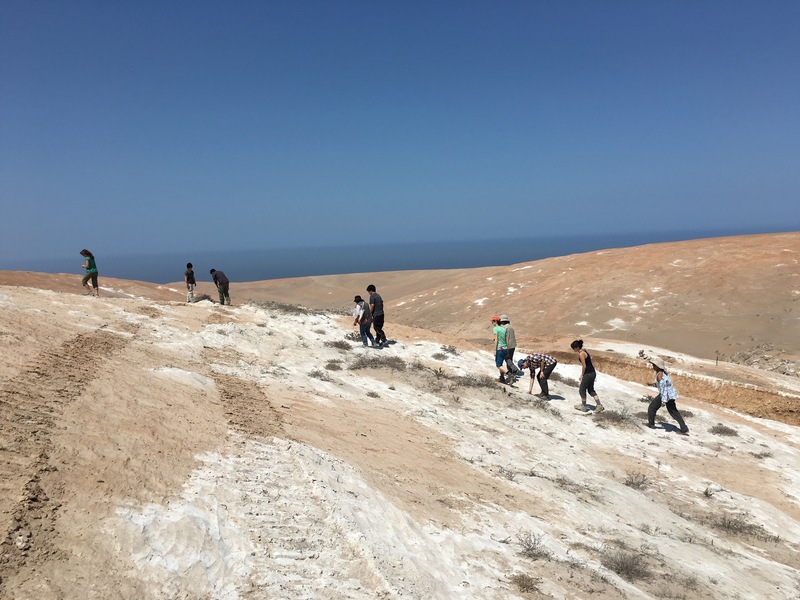 And so over spring break, Edwards brought her class to join with Arakaki’s students in methodically surveying plant species along several hundred kilometers of Atacama mountainside, covering an elevation range of nearly 12,000 feet. 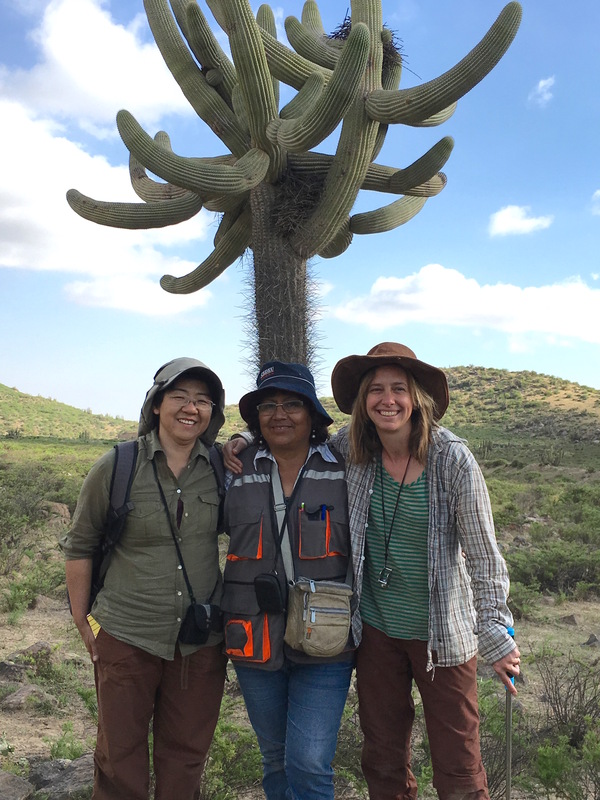 On each day of this “cross-cultural extravaganza,” Edwards said, the team of 26 Peruvian and U.S. botanists would pile in and out of a bus they dubbed “Priscilla Queen of the Desert” in homage to a 1994 Australian film, for a day of gathering samples of the flora. Moving up and down the slopes, where annual precipitation varies from zero to a few hundred millimeters, they found more than 200 different species. In the absence of much rainfall, plants in a few places subsisted instead on a seasonal fog. In other areas, the vegetation was rich and alive. The expedition is something Edwards was eager to involve students in. She loves watching students thrive in the lab and wanted to immerse them all the more in the ultimate laboratory: nature itself. Monica Arakaki, Fátima Caceres of Universidad National de Arequipa, and Edwards led the expedition. Jack Diedrich said the trip was a major reason he enrolled in the class, although he has also taken classes with Edwards before and praises her “passion for plants and teaching and her engagement with her students.” He said the trip provided an amazing exposure to the diversity of plant life. Fellow student Elissa Johnson echoed that sentiment. Though Edwards was looking for CAM and C4 species (and was surprised about how many C3 plants were there), she also invited students to ask their own questions about what they observed. Since getting back, they have been comparing, standardizing and analyzing their data and drafting a manuscript about the findings. This week, however, Edwards took a break from class to accept her award in Washington. She attended ceremonies at the U.S. Department of Agriculture, where she received the official award certificate, and at the National Science Foundation, where the 21 honorees met and mingled with director France A. Córdova, who had visited Brown just a few weeks earlier. But the main event, of course, was the White House, where Edwards was the first honoree to shake Obama’s hand. After the president said “a few kind words” and a photographer snapped the official pictures, her position in the photo arrangement gave her that honor in the receiving line that followed. 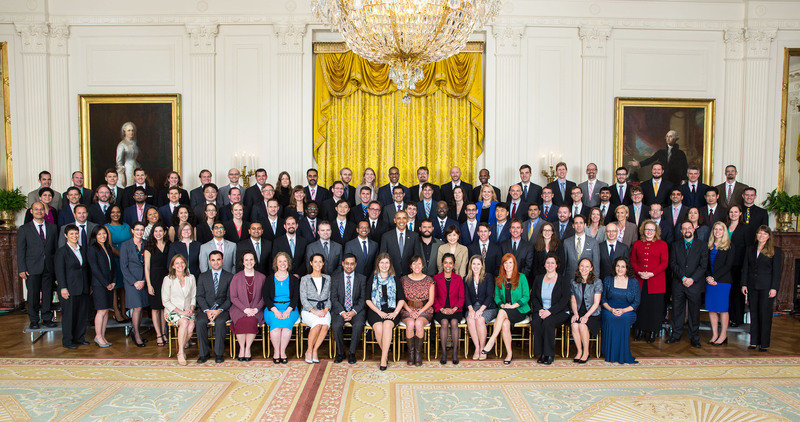 President Barack Obama joins recipients of the Presidential Early Career Award for Scientists and Engineers for a group photo in the East Room of the White House. Edwards is on the far left in the front row. Edwards confessed she was “a little star struck” and that she took full advantage of the moment. Obama wasn’t the only celebrity to greet the honorees, either. Jeff Bezos, founder of Amazon.com, and John Holdren, director of the White House Office of Science and Technology Policy accompanied the president, Edwards said. Edwards said she was deeply grateful and humbled to be recognized not just by the president, but also by the NSF program officer who nominated her. In the big picture of global existence, plants are essential — but in matters of public science, botanical discovery is often less celebrated than medical and engineering advances. Many people take plants for granted. “My fellow botanists and I are always trying to search out a cure for what we call ‘plant blindness,’” she said. “People walk around in their day-to-day lives surrounded by plants, but they don’t ever see them. Certainly Edwards hasn’t been bored lately. 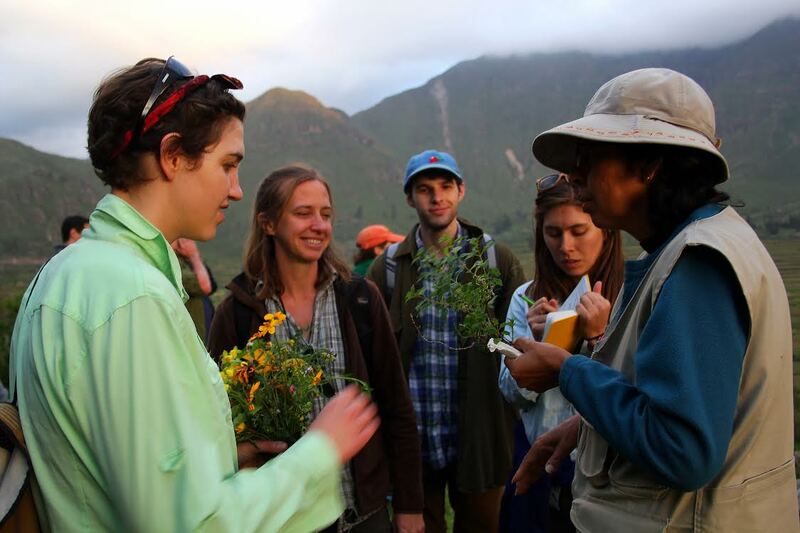 Instead, as a botanist, she has explored the world’s driest desert and met the president of the U.S.
Edwards looks over some plants gathered with Sophie Duncan, Will Klimpert, Haley Carter, and Mery Suni Ninataype.